Learning ,Contributing and Developing: Yahoo..... Happy news to share with you all...I am in Cloud 9 !!! Yahoo..... Happy news to share with you all...I am in Cloud 9 !!! 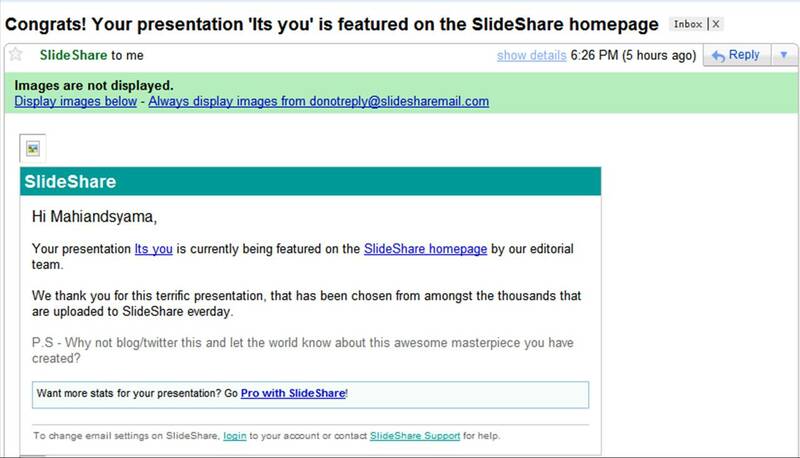 I am very very glad to share with you all that my presentation " Its You" has been selected by Slide Share Editorial team to feature on It's Home Page. Mail from Slide share appended to show off my pride! It's still in contest for World Best Presentation Contest - Horror show! Watch the presentation and vote for me! Here is the link. Slide share Is a great site for Presentations.create an account and watch the site regularly. You will LCD - Learn ,Contribute and Develop! View more presentations from Mahi Syama. Cloud9? The only Clound9 I know is a dota players team)) But I'm glad your work was selected. And your Its You presentation is very good too. But I've found some mistakes there. Maybe you should check paperial prices and peak some essay writing service to check your presentation?